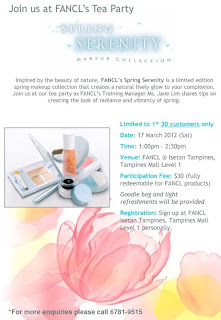 Fancl is having their Spring Serenity Makeup Pre-Launch Tea Party at Isetan Tampines. 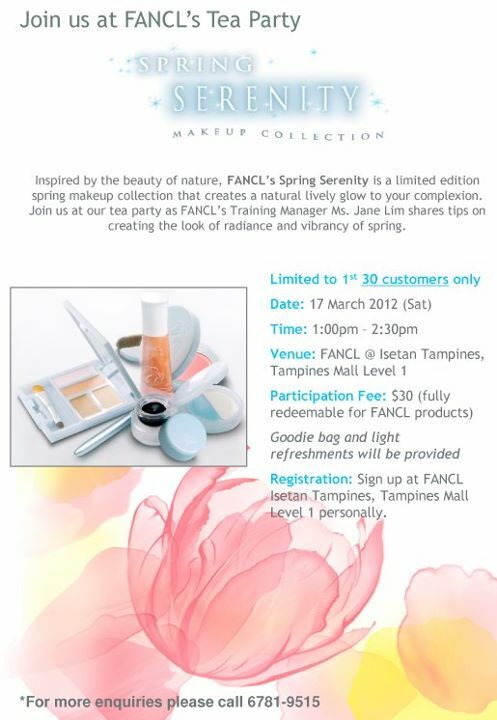 Their Training Manager Ms Jane Lim will be sharing tips on creating the look of radiance and vibrancy of spring. Limited to 1st 30 customers only. Though I've shared some time ago, thought that I better say it again as the Isetan Beauty Festival is coming this Friday =) Check out the details below. Aveda offers free travel size product and free shipping with any $40 order. Enter code Volume32 or Straight32 at checkout. Valid thru Mar 12. BareMinerals offers free shipping on any purchase of the spring trends. Enter code TRENDS at checkout. Valid for Mar 12. Carol's Daughter offers their membership at $5 (valued at $25) and 10% off any purchase with your membership. No code needed. Valid thru Mar 13. Cherry Culture offers 20% off any order. Enter code MMM2012 at checkout. Valid thru Mar 15. Clinique offers free shipping with any order. You can choose a deluxe sample at checkout. No code needed. Valid thru Mar 18. Hautelook is having NYX Cosmetics and Rapidlash events from Mar 12 thru Mar 13. LovelySkin.com offers free shipping and 20% off sitewide. Enter code GREEN12 at checkout. End date unknown. Sephora offers free deluxe sample of Shiseido Benefiance Eye Cream worth $19 with any purchase. Enter code BENEFIANCE at checkout. While supplies last. They are now having a Peter Thomas Roth Sale of up to 70% off as well, check it at thier Sale section. SkincareRx offers Buy One Get One 50% off on 10 products, plus a free Beauty Cache with $200 purchase. No code needed. Enter thru the link. Valid thru Mar 13.
feelunique.com offers 10% off any purchase of BareMinerals. No code needed. Valid thru Mar 14.